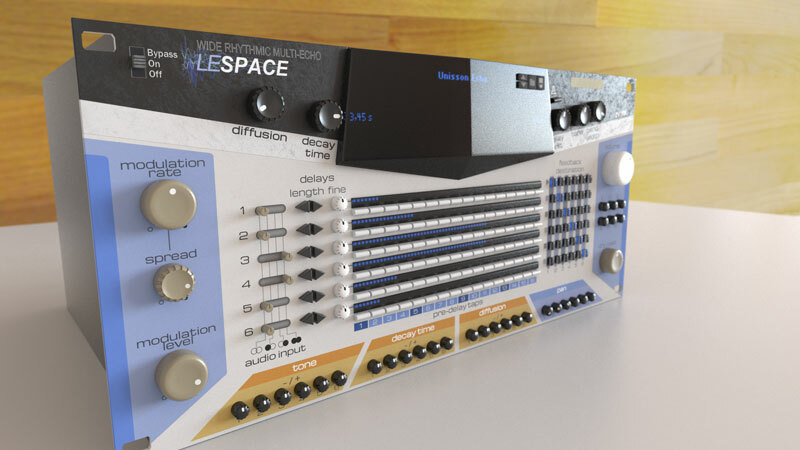 LeSpace is a delay based effect with a particular emphasis on rhythmic multi-tap echoes and increased stereo width. With six individual delay lines, each with individual controls for pan, volume, decay, length diffusion and tone, a wide variety of effects can be programmed from simple echoes to reverbs and choruses. But most of all, LeSpace lets you create complex delay based rhythms that can enhance your leads or drum loops with a great sense of stereo space. Activate up to 16 delay taps per echo line, all synced (or not) to the current tempo song. Each tap can furthermore be attenuated to enhance accents. For even more complex rhythms, each echo line has a specific delay line length and feedback destination. Each echo line can be panned in the stereo space. LeSpace’s stereo isn’t your standard stereo, it’s extremely wide. Just listen to the Soundcloud examples for a feel of how it sounds. Internal modulators let you vary the delay line lengths for a richer sound, vibratos and chorus effects. Of course, turning to the back panel of LeSpace lets you gain access to CV inputs for further modulation craziness. The Rack Extension comes with a variety of patches, exotic or standard. Check out the Soundcloud links to get a taste of what they sound like. LeSpace is available exclusively for Propellerhead Reason 6.5 / 7.1 and Reason Essential 1.5 / 7.1 on all supported hardware platforms. It is purchasable and downloadable through the Propellerhead Shop or through the links on the top right side of this page.